Those who pre-ordered Assassin's Creed: Brotherhood have recently been claiming their pre-order bonuses, which includes the game's soundtrack. 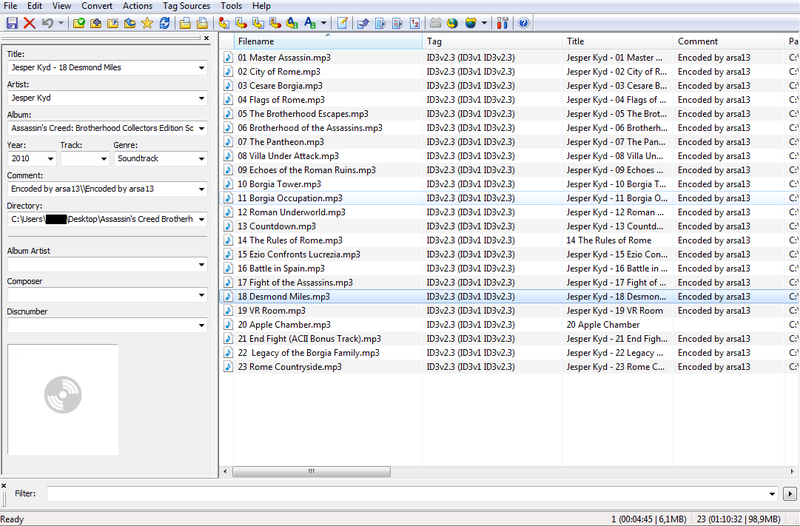 One eagle-eyed pre-purchaser had a close look at the files, and noticed that they have been encoded by "arsa13", a user responsible for putting up illegal copies of the soundtrack on Torrent sites, suggesting that the MP3 soundtrack distributed as part of the Assassin's Creed: Brotherhood is ripped from illegally uploaded files. Reddit user plginger noticed the connection when he had a closer look at the soundtrack files, noting the name arsa13 in the encoding credits. The same name turned up time and time again on sites distributing the tracks illegally. According to TorrentFreak, this isn't the first time that Ubisoft have used illegal sites to make their job easier. In 2008 they distributed a no-CD crack as a fix for Rainbow Six: Vegas 2. In 2010 , Rockstar released Max Payne 2 on Steam. The exe file contained an ASCII logo for a hacking group known as Myth, suggesting that Rockstar may have used a hacked version of the game to port the game more easily. Of course, as Ubisoft and Rockstar are the original owners of the files they're downloading, they're not doing anything illegal. Still, it's interesting to see them using the same piracy services that they've condemned, don't you think?